What about the Victoria Bridge and the Jacques-Cartier Bridge, the two other St. Lawrence River bridges that connect to the urban core of Montreal? Definitely very aged bridges. If there is a plan to eventually upgrade (widen, parallel or replace) one or both, then that could be part of the decision on the width of the new Champlain Bridge. Need to consider the approaches of the Champlain Bridge as well. If they were to build a 10- or 12-lane bridge, then they need equally capacious approach freeways to take full advantage of the size of the bridge. Given on how urbanized that area is it looks rather difficult to widen those freeways beyond 6 lanes, maybe to 8 lanes, but then the new bridge will be able to throw 5 lanes in the direction of peak traffic. There's definitely room. A-10, 15, and 20 are all squeezing together. A properly designed interchange on each side would be able to get to at least 8 lanes, if not 10, without modifying beyond the various splits. As for making a dent, I'll disagree because we're talking about AADT. That's not the same as number of people. Even if you replace 5,000 vehicles a day with 100 buses, your AADT goes from 150K to 145K. That's still enough for 8 lanes. It looks pretty tight in some places especially between a line of buildings and a canal, but I will grant that there may be space for 8 or 10 general purpose lanes. I found the environmental document, but it didn't answer several questions, 1) alternatives analysis including that of a wider bridge and approach highways, 2) how/where the 2-lane transit roadway connects to other roads, 3) operational plan for transitway such as besides buses what other vehicles will be allowed (HOV or HOT could mean lots of AADT), and when it may be converted to light rail (and presumably eliminate HOV or HOT). They may have reasoned that providing 8 lanes on 3 separate roadways (3-2-3 config) was enough of an improvement given the massive costs of $3.5 billion. But I would like to see an official analysis for the design and costs of say a 4-2-4 config and associated freeway approach upgrades. ...versus the current six lanes total (one restricted to buses during commute hours). Are you saying that one of the "lanes" being counted is for light rail? I don't know. When I read that, I assumed that the South Shore Branch of the REM would engage in street-running to cross the bridge -- that each transit lane would also have rails. If they went with one lane and one railway, then they'd be limited to operating one direction only...and I think that would create an issue for the viability of that branch of the REM. Wikipedia claims that REM would run on "a rail deck"....but I'm not certain where they would add a separate rail deck; and with South Shore service scheduled to begin in 2021, there isn't much time to add one. Discussion of number of lanes begins on page 14. Someone with better knowledge of traffic engineering could probably do a better job of summarizing/interpreting, but to my inexpert eye, it looks like the study said "3 lanes gets us LOS E or F. A 4th lane would add capacity, but demand would increase so we'd still have LOS E or F." Given the local push for transit, the powers that be presumably didn't see "more traffic in a bigger traffic jam" as a desirable outcome. Those LOS are the highest level of congestion. What the analysis doesn't show is the relative impact on the -length- of the congested period, i.e. a time profile curve of the levels of congestion. Even if more lanes might not have a major effect on peak congestion, it might considerably shorten the time length of it. "Analysis of the levels of service (LOS) of the various scenarios shows that adding a 4th lane on the bridge (Scenarios C and D) would offer little benefit in terms of levels of service on the Champlain"
They also said that the 4th lanes would merely attact traffic from the other river bridges and then total Champlain traffic would increase to cause what the above quote says. "The addition of a fourth lane in each direction on the Champlain Bridge would obviously allow it to carry a larger flow. However, according to the demand simulated for the 2026 PPPM, this fourth lane would not result in an improvement in traffic conditions on this main artery: in fact, whether the bridge has three or four lanes, the level of service would remain at “F” and at the same time cause significant transfers of traffic from other bridges to the Champlain Bridge. " Translation: "No matter what we do traffic will still be horrible so why bother with 4th lanes". FWIW, while they don't have by-hour impacts of the different lane options, they do provide a 2004 profile for the old bridge on page 11. The staging study did include volume profile curves for the Champlain and other crossings (pg 65 for the Champlain). As the pre-feasibility study said, in order to justify widening the bridge the approaching freeways would need to be widened. Given how that's pretty well a non-starter in this day and age there's no sense adding the extra cost to the bridge. Removing traffic from other bridges sounds like a positive. That means people are better served by the Champlain Bridge but can't get there today. Per-person savings of time and mileage add up quickly. Not to mention that an 8 lane bridge doesn't mean the approaches need to be that wide. The A-10 overlap is only on the bridge, so dropping to 6 lanes on either end of the bridge would make sense (would still require some widening to the west, but not as much). Seriously, Montréal is congested pretty much all the time. Something needs to be done. It's amazing how Canadian cities tend to be more congested than similar-sized American counterparts. Montreal is so much congested that adding a brand new six-lane (3-3) bridge, between Montreal and its south shore, would not be enough to solve traffic problems. A six-lane bridge was added between Montreal and Laval (Olivier-Charbonneau bridge, A-25) in May 2011, but no notable traffic improvement was seen since then. It would be the same for south shore. Just remember that no lane was added since the opening of the Lafontaine Tunnel, in 1967; it's like 51 years ago! Don't try to convince me that population, on both sides of the bridge, didn't increase since 51 years! In Montreal, when a problem occurs, they shovel it forward; the Champlain problem was shoveled forward since over 30 years! So since this time, the bridge decayed so much that it now costs over 100M$ a year just to keep it strong enough to support traffic. With that pile of money, we would build many miles of new highways. About approaches, let's look first on the south shore; there's three lanes coming from the Autoroute des Cantons-de-l'Est (Eastern Townships Highway, A-10 west), plus one from each direction on René-Lévesque Highway (A-15 north/A-20 west/QC-132), those two merging together into one lane, for a total of 4 lanes. Champlain has three lanes towards Montreal, so there's a "funnel effect", there, every morning rush hour. On the Montreal side, now; actually, there's two lanes from Turcot Interchange (A-15 south/A-20 east), and two from Bonaventure Expressway (A-10 east). Without counting Nun's Island ramps, we have a total of 4 lanes, so we have, again, a funnel effect when going towards the three lanes of the bridge. With the new bridge, we will have one more lane coming from Turcot (3 instead of 2), for a new total of 5 lanes that, believe me on that, will be full at every afternoon rush hour. And how much lanes will we have on the brand new Samuel-de Champlain Bridge? Yeah, only three! So I'm still looking, more than 4B$ later, for any kind of traffic improvement. And for those who were questioning about the transit lanes, on the center carriageway of the new bridge, forget about running any kind of vehicles on those lanes! The federal government offered those two lanes for transit to Quebec, letting that government going on with their own project, so the MTQ decided to forward them to the REM, so don't even think about turning them in HOVs. Montreal is so much congested that adding a brand new six-lane (3-3) bridge, between Montreal and its south shore, would not be enough to solve traffic problems. A six-lane bridge was added between Montreal and Laval (Olivier-Charbonneau bridge, A-25) in May 2011, but no notable traffic improvement was seen since then. That doesn't mean that building the new freeway and river bridge was worthless. Without that the traffic conditions may have grown much worse, in intensity and/or length. 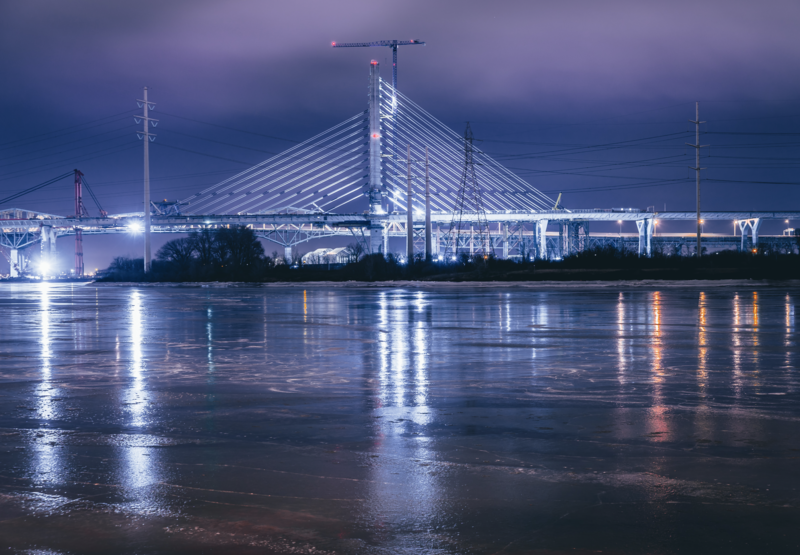 It's worth noting that the new bridge may be under-utilized due to the rather high tolls charged for crossing it. After extensive protests from the national government in Quebec, Trudeau had the federal government drop the demand that the new bridge be tolled. Pont Victoria is primarily a railroad bridge owned by and carrying the double track mainline of the Canadian National Railways to Quebec City, Halifax and the eastern US. There are single lanes on outriggers on each side of the rail bridge......and I can't really see how additional lanes could be added without a major reconstruction. It would probably make more sense to twin or replace the Jacques-Cartier. When the St. Lawrence Seaway - St. Lambert Lock was constructed in the '50s.....the eastern end of the Victoria Bridge was reconstructed with a lift span inserted and a bypass constructed to the south so rail or road traffic could continue unimpeded if a ship was locking through. My comment was in response to Beltway's comment regarding the A-25 bridge. Trudeau removed toll on the future Samuel-de Champlain Bridge. About Olivier-Charbonneau (A-25) Bridge, there was a deal between the operator and the MTQ; if AADT comes over a certain amount of vehicles per day, the toll has to be strongly increased, creating an effect to remove traffic from that bridge. That's probably why the toll increased strongly in the last years, because at the opening of the bridge, the toll was quite reasonable. Not to mention, there's a significant increase in the toll amount for not having a transponder, and the transponder has a monthly charge. Meanwhile on the Thruway, the cash/bill by mail tolls are not much more than the NY E-ZPass rate, and there are no fees of any kind for having a transponder (there is a $25 deposit for opening an account, but the entire amount can be used for tolls with automatic account replenishment). And the A-25 transponder isn't interoperable with anything, not even A-30! I don't think I've even heard of a metro area having two, non-interoperable transponders anywhere else. It's gonna be a nice looking bridge, no doubt about it. I don't know how the Thruway Authority works with state administrations about pay-by-the-license-plate, but in QC, A-25 administration cannot keep SAAQ information on file, so it must request the info at each and every passage on the bridge, at about over 5$ per shot. That's why it's so expensive without the transponder. At least, it's what they say. On the fact that A-25 transponder does not work on A-30 (and vice-versa), it seems that the MTQ did not put in their contract with those hiighways operators that their transponders must work on other highways, so each highway operator built up his own system, without any connectivity with others. It's a standard in province of Quebec; everyone works for himself! It would be too easy to work with others; imagine a "Québécois" transponder that works with EZ-Pass! From what I could see when driving home today, the gap between the two sides of the southbound carriageway is down to about 1-2 meters. Road meet expected 6/8 or 6/15. Maybe it's just Chrome's translation, but it looks from the article like the federal government doesn't think the bridge will actually be open by then.